Nestled on the beach, this Crown Point resort is just steps from Fort Millford and Store Bay. Pigeon Point Beach is 2.2 mi (3.5 km) away. The service was excellent. The atmosphere was excellent, very calming and peaceful. The breakfast service was good. The pool was great. The staff was polite and helpful. The staff was small. The front desk did not answer the room phone and I called several times. 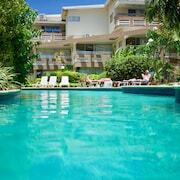 Where to find Tobago hotels near an airport? 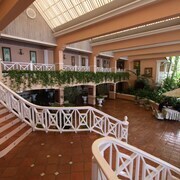 Where can I find hotels in Tobago that are near tourist attractions? You’ll be begging to stay longer in Tobago once you catch sight of the tropical wonders waiting for you. The smaller island of Trinidad and Tobago is not to be underestimated when it comes to beauty and adventure. Following an initial sighting by Christopher Columbus, the island went on to be heavily influenced by Dutch, Swedish, Spanish, English, and French influences, making it a melting pot of flavours and culture. Today's Tobagonians will be more than happy to speak to you in the island’s official language of English when you order food at restaurants or check in at hotels in Tobago. Try to get a room or table by the shore. Unspoiled beaches and monstrous palms make it easy to see why the island is thought to be the inspiration behind "Robinson Crusoe." Expedia.ca will make sure your vacation plans don't get shipwrecked by high prices. Let us lead you to all the best traveller attractions and hidden spots on this tiny island of big adventure. Warm breezes and calypso music offer a dose of therapy to all who travel to Tobago. Spending time near Scarborough offers you the option to visit Fort King George or hop on a ferry to Trinidad. You should keep in mind that many Tobago all inclusive hotels are situated on the shores of Crown Point, Pigeon Point, Buccoo Reef, and Store Bay. You can head to Pirate's Bay on the island’s northwest corner to experience fewer tourists and rougher waves. The large coral communities off its coast make Tobago one of the Caribbean’s top spots for scuba diving. Don’t be surprised to see tropical fish and turtles swirling at your ankles when you submerge your body in the blue magic that surrounds the island. It’s nearly always warm and sunny on this Caribbean island. Tobago’s consistent warm weather means a great vacation is waiting for you whenever you have some free time in your year. 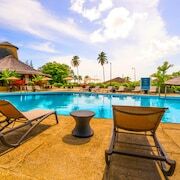 Booking a room at one of the Tobago hotels near airport makes it even easier to plan a quick and easy vacation during a break from work or school. You’ll love surrounding yourself with celestial tiers of water and harmonious crickets at the Argyle Waterfall. Add an excursion to Nylon Pool to your agenda. Many of the tour boats headed to this popular swimming spot feature glass bottoms for your viewing pleasure. When you’re ready to spread your wings and fly from the beach, Genesis Nature Park offers the chance to interact with tropical birds of every feather. 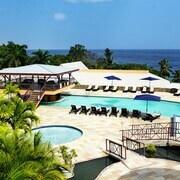 When you’re ready to plan your stay at a top Tobago hotel near the beach, visit Expedia.ca for hot rates. 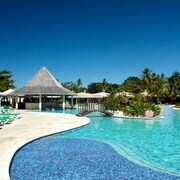 You’ll love having the option to combine discounts on resorts and flights to Tobago for one cheap price. If exploring remote beaches is on your agenda, you should definitely consider using our deals to rent a car in Tobago. 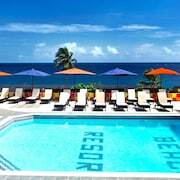 You'll want to act fast before our terrific rates on Tobago vacations evaporate in a Caribbean breeze. 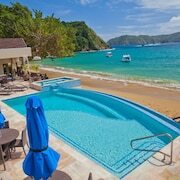 What are the most popular Tobago hotels? 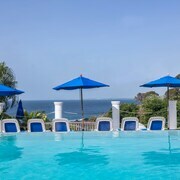 Are there hotels in other cities near Tobago? 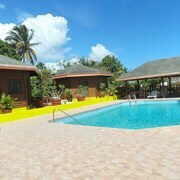 What other types of accommodations are available in Tobago? Explore Tobago with Expedia.ca’s Travel Guides to find the best flights, cars, holiday packages and more!